At SocraTec R&D we started our early-phase oncological activities back in 2005. From our experience with early patient studies in the field of pain management, we were aware of the difficulties of such early-phase trials. We established project-specific scientific and logistical support for multi-centre PK studies – a real challenge. But the high level of standardisation with local feasibility assessments of our PK experts and local trainings of our project managers and study nurses result in good success. Very often recruitment fails because of inclusion/exclusion criteria. Our oncology experts all have practical experience in the daily routine of treating oncological patients. Together with them, we support our sponsors in finding the best solution, always keeping in mind the aims of the trial but also the feasibility of patient recruitment. It is of course obvious that conducting early-phase trials in experienced phase-I units is of tremendous advantage with regard to the quality of data. 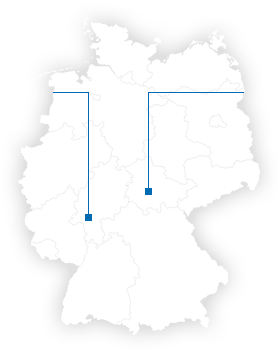 Thus, we established a highly effective referral system for the recruitment of oncological patients around our phase-I unit in Thuringia and have now extended this network to the Rhine-Main area. Pharmacokinetics, immunogenicity and bioactivity of the therapeutic antibody catumaxomab intraperitoneally administered to cancer patients. A detailed specification of our oncological trials, the recruitment system as well as the network characteristic is presented in our Oncology Flyer.